FAIRBORN — B-W Greenway and the Fairborn Art Association have partnered for the eighth year to host a juried art exhibition, Landscape2018, attracting 44 local artists and 83 pieces of work. The opening reception was held July 15, and Carol McNeeley placed first with “Dead Tree and Boulder;” Yuki Hall placed second for her body of work; and Brendan Higgins placed third with “A Path.” Siobhan Fitzgerald earned the juror’s choice awatd with “Green Spaces Shouldn’t be this Hard to Find” and Kim Ceccerelli, Carol Collette, Billie Dickson, Connie Gifford, Susie King, Jim Little, Kevin McNeeley, Katrina Pierce and Barb Stork earned honorable mention ribbons. The judge for Landscape2018 was Eva Buttacavoli, executive director of the Dayton Visual Arts Center. The B-W Greenway and FAA partner to host the juried art exhibition annually to heighten public awareness of local greenspaces and the need to preserve these assets. Each year, a different location within the greenway is selected for the artists to develop their artwork. The 2018 location was Oakes Quarry Park in Fairborn. 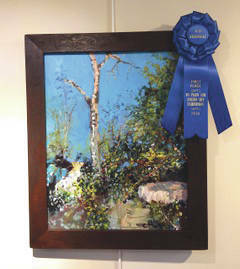 The Landscape2019 Juried Art Exhibition has selected Garland Wetland Reserve as the subject for the competition. The artists are welcome to begin working immediately. Additional information will be found on the B-W Greenway website soon. B-W Greenway is greatly appreciative of the partnership with the Fairborn Art Association to sponsor this wonderful competition and show. The pieces of art were displayed in the gallery and were enjoyed by B-W Greenway members and the community. Contact Whitney Vickers at 937-502-4532. Information courtesy of the B-W Greenway.